Living the Country Life one day at a time … at the place we call home! I used to paint with a friend of mine every Monday. We painted on anything we could find suitable that the paint would adhere too. One day she brought some surplus wooden boxes. They were too good to throw away, so we had to think of something to paint on them. I started looking for ideas from some old painting books that I had picked up from a garage sale and found the perfect thing. Yea, bathroom tissue holder! It is also very useful. 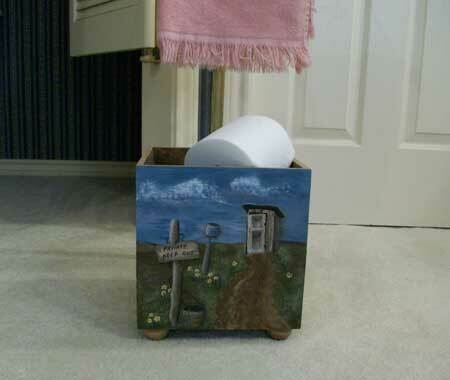 This entry was posted in Painted wood crafts and tagged bathroom, country crafts, crafts, diy, hand painted, painting, wooden box on Saturday, September 8, 2012 by Betty. What is this blog all about? Showing off the handmade and hand painted crafts I have made over the past several years. Living life with my husband after retiring and moving to a small farm in the country. Working with the weeds in our flower and vegetable gardens. I hope you'll enjoy reading it and if so please leave me a comment, it'll make my day!